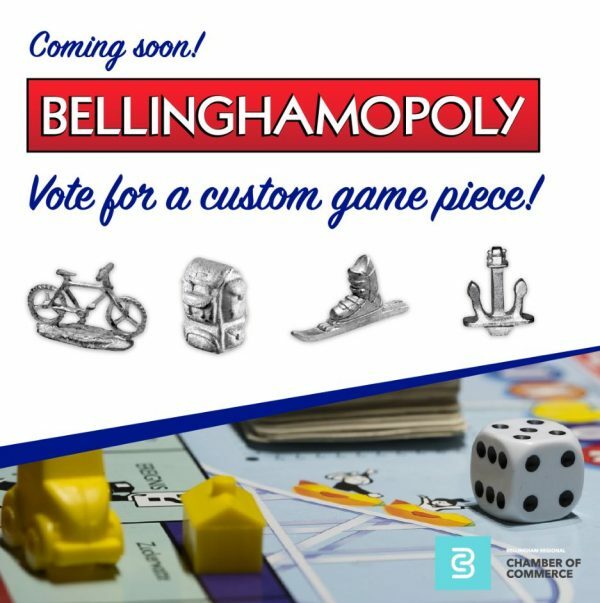 The city of subdued excitement gets its own game…introducing BELLINGHAM-OPOLY! The Bellingham Regional Chamber of Commerce has partnered with game vendor Late for the Sky Production Company to create BELLINGHAM-OPOLY, a Bellingham-themed monopoly game which features local businesses, events and parks! The game will be available for purchase in August 2018 at Whatcom County Haggen locations, Woods Coffee shops, Village Books, and the Western Washington University student bookstore on campus. Haggen and Woods Coffee are major sponsors of BELLINGHAM-OPOLY. The Facebook and instagram contest encourages users to vote on their top favorite out of four options: a ski, a bike, a backpack and an anchor. This contest will run in early May 2018. You can find it on Facebook @bellinghamchamber and on Instagram @bham_chamber. The hash tag will be #bellinghamopoly. Board spaces are sponsored by iconic member businesses, events and parks. “We planned the game board intentionally to focus on places and events that people would recognize. We want it to be attractive to locals, tourists, students, former students and former residents. That guided our decision-making and led us to make strategic choices about who and what should be on the game board, said Shelli Jones, Marketing Coordinator for the chamber of commerce. Proceeds of the game will benefit the Bellingham Regional Chamber of Commerce. Late for the Sky Production Company began making specialty board games in 1984. Late for the Sky is dedicated to working toward the manufacturing of completely earth-friendly games. 100% of the unused paper involved in making our games is recycled. The fiberboard used in making the set-up boxes and game boards is all recycled material. Late for the Sky is an alcohol free printing operation that uses only soy based inks. Corn based shrink wrap is currently being used and will soon replace all petroleum based shrink film. Plastic game trays that hold game parts, currently a high impact styrene, are being replaced by a water bottle grade #1 recyclable material. Metal game tokens are being transitioned from lead-free pewter to zinc. Recycled glass is becoming an alternative to styrene “house and hotel” game pieces. All of our games are made in the USA – produced in Late for the Sky’s Cincinnati facility. The game parts are all domestic, and most are produced less than 50 miles from the operation.